Dealing with seriously ill staff who want to work fills many employers with panic. If an employee has a condition such as cancer, heart disease or severe diabetes, alarm bells sound. Is this person well enough to work? Will their job worsen their condition? Will the employer face legal liability if a sick member of staff decides their work situation has had an adverse affect? No matter how motivated the employee is to return to the workforce, many HR departments worry about getting this right. Dr Les Smith, managing director of consultancy Health and Wellbeing UK, says this issue will become increasingly important. “Cancer, heart disease and severe diabetes are the three most common serious conditions, and they will become more widespread as thepopulation ages,” he says. Understanding of all these conditions needs to improve, says Smith. After all, an employee with a serious medical problem can still make an important contribution. “In fact, someone can be capable of doing more if they have had successful treatment for heart disease, for example, than they were when they were experiencing the early symptoms,” he points out. The first priority should be to have a confidential and supportive meeting with the employee to find out as much as you can about their condition, whether they are left with a disability, the extent and frequency of the treatment and hospital visits they are going to need, and their overall morale and emotional state. This is definitely an HR issue that requires a holistic, sensitive approach. Talking to the employee is essential, but it’s also worth boosting your own knowledge by contacting a relevant support organisation. Cancerbackup, the British Heart Foundation (BHF) and Diabetes UK all have useful information about living with these illnesses, and both Cancerbackup and the BHF have specific guidelines about employment rights and best practice. In all cases, it is important to provide the employee with information including: flexible working/work adjustment policies, their rights under the Disability Discrimination Act (DDA), return-to-work policies and (if available) employee assistance programmes, private medical insurance, occupational health services and counselling support. Employees should also be told how absence from work will affect them financially, in relation to sick leave and sick pay policies, any critical illness, long-term disability or permanent health insurance plans and statutory sick pay. The DDA requires that employees affected by serious illness but capable of working should have reasonable work performance targets, adjusted to reflect their illness, and that eligibility for incentive schemes should not be discriminatory. It’s essential to give the employee full information on their statutory rights, and to direct them to any other sources of information that may be helpful. If someone is receiving treatment, HR needs to consider planning a reduced or more flexible work schedule. This can include arranging for them to carry out lighter duties for a period of time, temporarily reallocating some work to other members of their team, adjusting performance targets, working from home and arranging for a colleague to be a work ‘buddy’ who will keep them up to date about anything happening at work while they are absent for rest or treatment. If the employee finally returns to work after a long period of treatment or illness, and has a temporary or permanent disability as result, the organisation will then need to provide information about any insurance schemes that the organisation offers. It is also worth knowing about Access to Work, a scheme run by the Department for Work and Pensions, which will carry out an assessment of the needs of the person at work, and produce a report recommending any changes that may be needed. For patients with heart disease, manual work or heavy lifting may be out of the question. But again, this depends on the severity of their condition. In some cases, staff with heart disease may need to change to a different type of work. And people with diabetes can still carry out most roles. A study of 30,000 workers carried out by Dublin-based organisation the European Foundation for the Improvement of Living and Working Conditions has found that British workers are less likely to take leave as a result of a work-related illness, coming 26th out of 231, and well below the European average. The survey also found that workers in laid-back Sweden are the most stressed (85%), followed by Finland (77%). The least stressed were Bulgarians (27%). Commenting on the survey, TUC general secretary Brendan Barber said it belied the image of UK workers using stress and back pain as an excuse to take time off work. 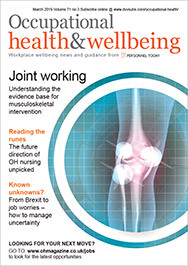 The Faculty of Occupational Medicine has launched the fourth edition of its Fitness for Work guide, which provides essential information on patients’ suitability for work, as well as legal aspects of occupational health. It is available from the Oxford University Press website (www.oup.com). A poll carried out by the US Pain Federation found persistent, chronic pain among workers had risen by around 40% in the past 10 years, partly because of more sedentary life styles. Almost nine out of 10 of those with chronic pain typically went to work rather than staying at home.